And why I think you should attend, too. Full disclosure: I am not on the board or planning committee for WITness Success, nor am I speaking at this year’s event. The organizers did not ask me to write this. 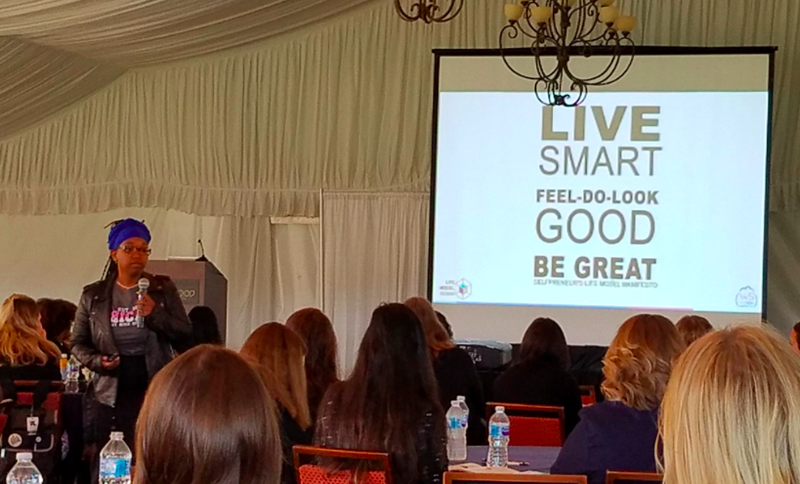 WITness Success is a conference centered around women working in the Salesforce ecosystem. It is community-organized and community-led, and features keynotes, breakout sessions, panels, and more. It is open to women and allies. This year’s event is July 27–28, 2018 in Denver, CO.
Last year, I attended the inaugural WITness Success conference in Chicago. What started as an idea turned into a 1.5 day event, with breakout sessions and keynotes — even a film screening from filmmaker Nora Poggi. I had such a good time at the event, it was on my must-do list for this year. Here are some of the reasons I’m planning to attend, and why I hope you’ll join me there. I attended a number of breakout sessions last year, on topics ranging from public speaking to managing your career. The speakers were top-notch and the content was valuable and actionable. But reader, take note: Speakers were also vulnerable and real. Take Davina Hanchuck, for example. Davina started her session by sharing that public speaking terrifies her. I mean, can you imagine being self-confident enough to start your session by admitting that? I was floored. Then she launched into what was probably my favorite breakout session of the conference. 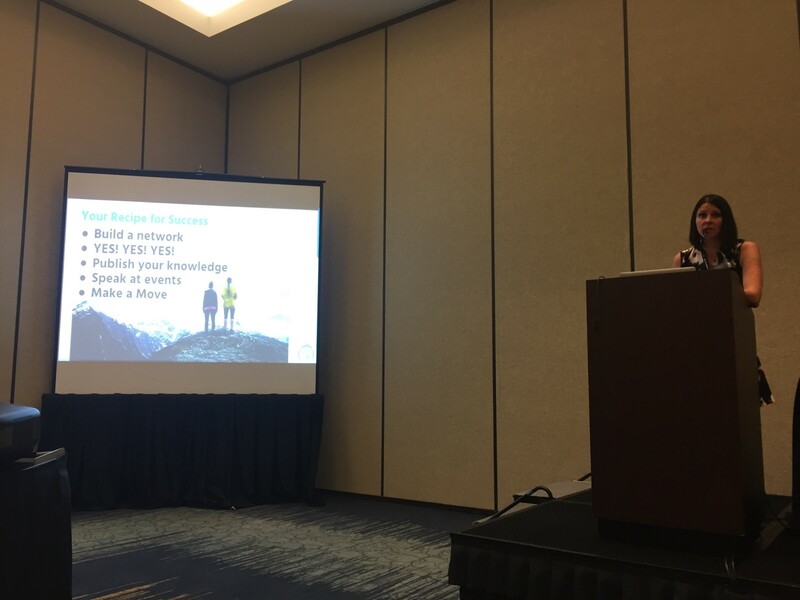 She shared her journey to becoming a Salesforce professional. Her story was honest, heartfelt, and full of good takeaways and advice for others looking to follow her lead. Davina’s vulnerability was mirrored by other speakers at the event, from the breakouts to the keynotes. And an amazing thing happened as a result. The audience followed their lead. During the Q&A for each session, people asked thoughtful questions that showed deep engagement with the content. In Davina’s session, we had a 20-minute conversation as a group, where we all kind of formed a half circle and talked about our careers. It was these conversations that made the conference feel rich and valuable. The conversations we had at the conference were meaningful. A big part of the reason they were meaningful is the way we were talking to each other. People didn’t talk over other people or interrupt them. People respected each other and listened. And during Q&A sessions, people actually asked questions. After years of attending tech conferences, this was a refreshing change. I didn’t once hear someone say, “I don’t really have a question per se, more of a comment or an observation…” and then go on to correct some small omission in the speaker’s PowerPoint deck or nitpick the way a speaker explained something. To that point, one night a bunch of us went out bowling together. We were not the best bowlers — I was particularly bad, and at one point I almost got us kicked out of the bowling alley when I rolled my ball and it went diagonally across two lanes. But we all were focused on having fun, and everyone was cheering each other on as we played. Vered Meir observed, “I think the way we all cheered each other during this bowling game is a good analogy for how supportive this conference has been.” Well said, Vered. That bowling night turned into my favorite conversation of the event. We had an extraordinary group of change-makers in that bowling alley, people like Selina Suarez, Shonnah Hughes, Rakia Finley, Stephanie Herrera, Rebe de la Paz, Mary Scotton, Tracy Kroznak, Annie Shek Mason, Ashley Creech, Kieren Jameson, and BOTH Marisas — Hambleton AND Lopez. Bowling balls were rolling and the conversation was flowing. We had a very honest talk about how to change the ratios in tech. This is like a who’s who of Salesforce change-makers right here. And you know what? Actual change came out of that night. Let me give you just one example. Mary Scotton had helped bring a PepUp Tech bootcamp graduate and former Year Up intern to WITness Success — a young woman named Andrea Perez Medrano. Both Selina and Stephanie introduced Andrea to the group, and they shared that Andrea was looking for work and while she had great skills, hiring managers kept telling her that she didn’t have enough experience. So I reached out to Andrea after the conference and offered mentorship. We started meeting regularly to work on her résumé, and I started introducing her to change-makers I know at Salesforce. Leaders like Marisol “Sol” Espinoza, also formerly from Year Up. Two weeks after meeting Andrea, Sol saw a job posting that she knew Andrea would be perfect for. She sent it to Andrea, and I wrote Andrea a letter of recommendation. Andrea impressed the hiring team and she landed the job at Salesforce. 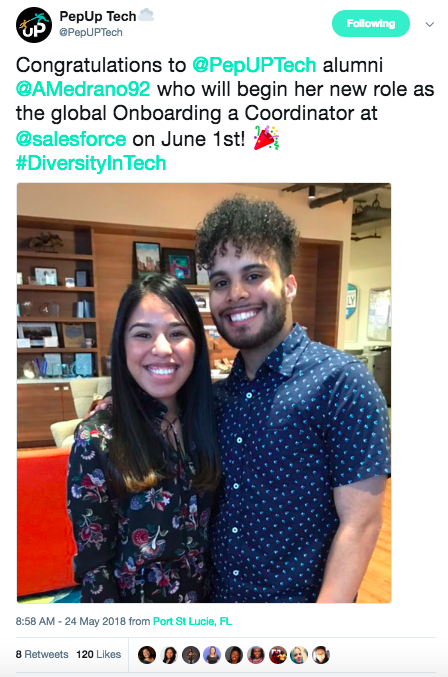 A year later, and she’s still thriving at Salesforce, now working at Salesforce as a Global Onboarding Coordinator. And she’s still connected with Sol (and me, too). These are the types of connections that have lasting impact, and the ones I treasure from attending WITness Success. The breakout sessions were fantastic. 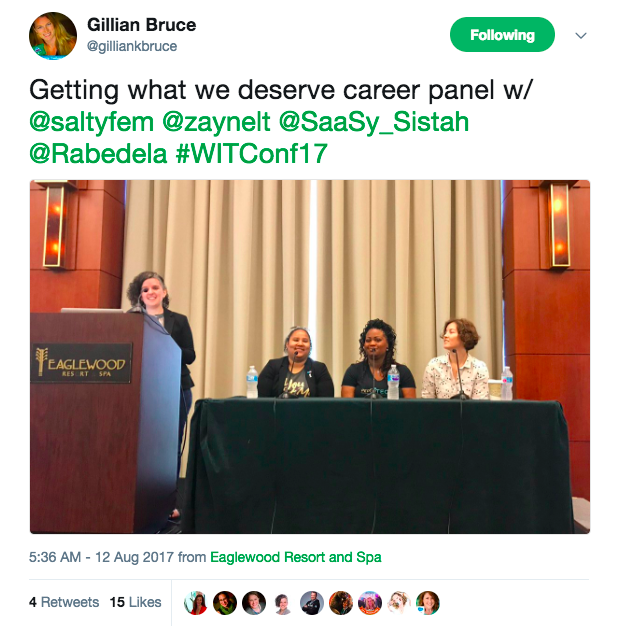 In addition to Davina’s session, I especially loved this panel, featuring Rebe, Shonnah, Vered, and Zayne Turner, on getting the career you deserve. I think this might have been the most-tweeted about breakout session of the event. The keynotes were also on point. Cheryl Porro gave one of the most honest talks I’ve ever seen about leadership in tech. And Ayori Selassie spoke on how to thrive in an era of change. Ayori has created a Life Model Canvas to help people get focused and stay balanced. This year, I’m excited to hear from Leah McGowen-Hare, Gillian Bruce, Brigid Warmerdam, Krystal Carter, Beth Comstock, Natalie J. Egan, and more! I mean, come on. Just look at these super rad keynote speakers. So I hope to see you at WITness Success! If you’re looking for real stories, a supportive environment, the chance to build lasting connections, and great content, come to WITness Success. And when you see me there, please say hello. I’d love to meet you. 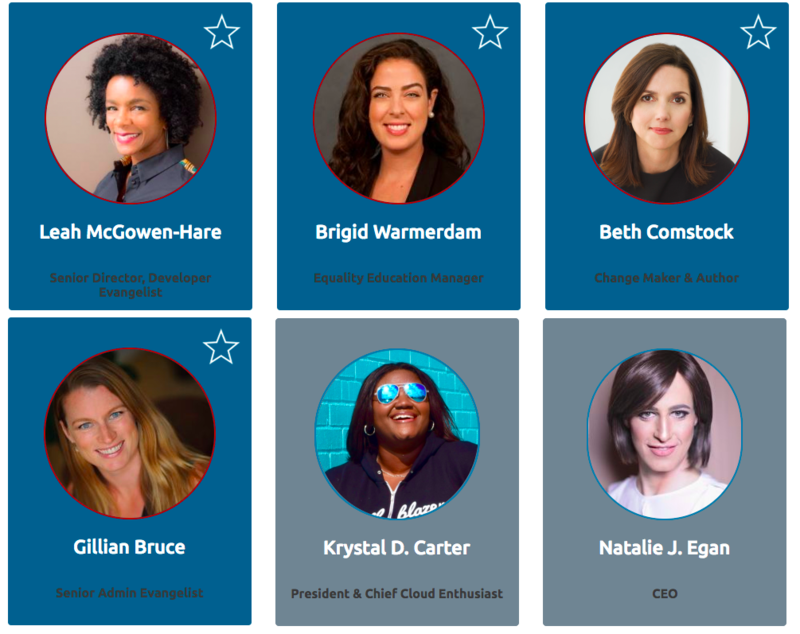 Description: WITness Success is a conference centered around women working in the Salesforce ecosystem. It is community-organized and community-led, and features keynotes, breakout sessions, panels, and more. It is open to women and allies. Senior Director & Editor-in-Chief of #Trailhead @salesforce, thoughts here are my own.